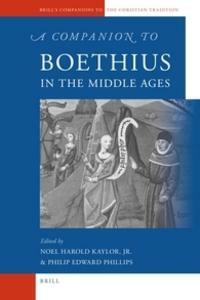 The articles in this volume focus upon Boethius's extant works: his De arithmetica and a fragmentary De musica, his translations and commentaries on logic, his five theological texts, and, of course, his Consolation of Philosophy. They examine the effects that Boethian thought has exercised upon the learning of later generations of scholars--including, to a degree, scholars of the 21st century. The field of Boethian Studies has enjoyed a continuous history of works that treat either the entire Boethian tradition or major aspects of it. This volume offers a comprehensive study, and its construction is systematic, considering Boethius's works both as central to the disciplines that they represent and to the areas of scholarly interest that they influenced, and it is framed by articles on the historical contexts in which those works were produced. Introduction: The Times, Life, and Work of Boethius, Noel Harold Kaylor, Jr.